Workout sounds great and all, but doing it dedicatedly is a completely different story. Sometimes it’s just too cold to run outside, too hot, too windy, it’s raining, you can’t afford a gym membership or simply you’re just lazy. The pursuit of a healthier, fitter regimen, especially when you are just starting off isn’t easy. It takes time and repeated efforts in order to actually get there and achieve some results. In order to get you started and make you crawl out of your bed, we’ve compiled the lazy girl’s guide to staying fit that’ll keep you motivated to burn that stubborn fat, without it feeling too heavy on you. What could be more inspiring than starting off your workout habit with a hearty shopping session? 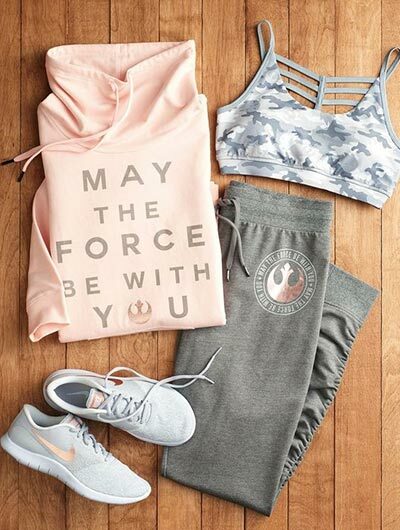 Go shop your heart out, pick your favorite trainers, tights, sports bras, hoodies, sweatshirts, T-shirts and hit the tracks clad in your newest buys looking good and feeling good too. If you hate leaving your house then think of investing in the bare necessities to make your workout sessions more do-able and hence simpler, at least during the bleak mid-winter. Having a few dumbbells, kettle bells, a skipping rope and a yoga mat can easily get you in the habit of working out daily. You can always up it at your own pace but it’s the start that’s most difficult. A real, killer cardio workout is one that you enjoy the most. Cardios can be indoors, outdoors, alone, with a friend or even with your doggo. Just choose one out of cycling, sprinting, skipping rope, dancing, trampoline-ing etc or use them on different days of the week to make your workout sessions more interesting. Combine these with a few strength training exercises and you are sure to achieve amazing results in no time. Having a friend who exercises with you is a valuable asset. Also, both of you can keep each other motivated when one of you wants to bail out on the sessions. Use your legs whenever you can. Even small walks add to the step count and result in increased levels of physical activity. So, the next time your friends asks you to fetch something – do it! Afterall, doing something is better than doing nothing. Always have a list of upbeat music that makes you want to move. If you like club jams, well then your workout sessions may be great to listen to your favorite mood. Exercise to not only look healthy but feel good too. So power down all the technology you've got (except your music system) and tune into your body for a dedicated time schedule meant just for your workout.